One of the things that has motivated us to breed fine dogs is our work in Search and Rescue. The simple fact is, not every dog is suitable to be a Search Dog. 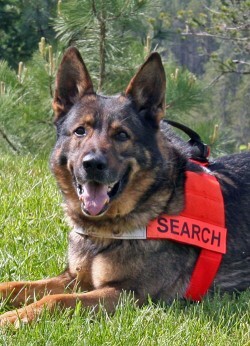 Therefore, early on, we sought to breed in order to produce dogs we could train as the best for Search and Rescue work. 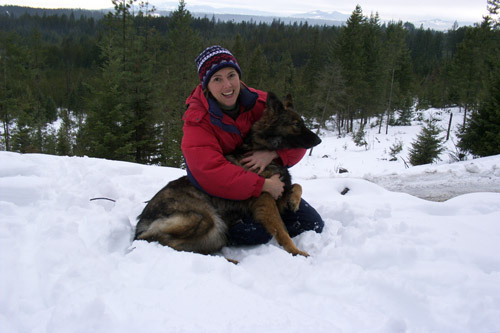 The following is the story of our first Search and Rescue Dog , Tag, found in many of our pedigrees, and one of her Searches where she was able to locate a missing person. An example of a search, which lasted long hours in difficult conditions, occurred one summer a few years ago. Tag and I were called in out to look for a missing man who had traveled in an unknown direction on his bicycle. No one knew anything more than that he could have traveled many miles away. Conditions were hot and dry. On the dry dirt roads where the police first directed our search, the fine dust from our footsteps danced in our headlamps. It had to be miserable for a dog, working close to the ground. Without moisture, scent created by the bacteria of human skin rafts, is near to impossible for a dog to detect. After working through the night, the next day, we were relocated to another area. After several hours, Tag caught the scent. With renewed vigor, she raced down a path. There we found the bike. Circling round she darted into the brush, to the body of the missing man. Returning to me, she barked, then led me to him. He had died of a heart attack. Now the family would have closure, and though it was sad, their panic could subside and grieving begin.